Exhibiting at trade shows can be one of the most powerful ways to get in front of a large number of prospective customers and build your brand awareness really quickly. At a tradeshow you can showcase your product line effectively, expand your client base, and grow your sales significantly just over a couple of days. As appealing as this sounds, Trade Shows also have the potential to be demanding and expensive which is why you need to plan strategically to get the best return on your investment. Not sure how to prepare for your first exhibit? Don't worry! We’ve put together a checklist of the things you need to do before you hit the show floor. Set your budget: Your budget will depend on your objectives. Will you be launching a new product? Capturing leads? Or marketing your services to boost your sales? 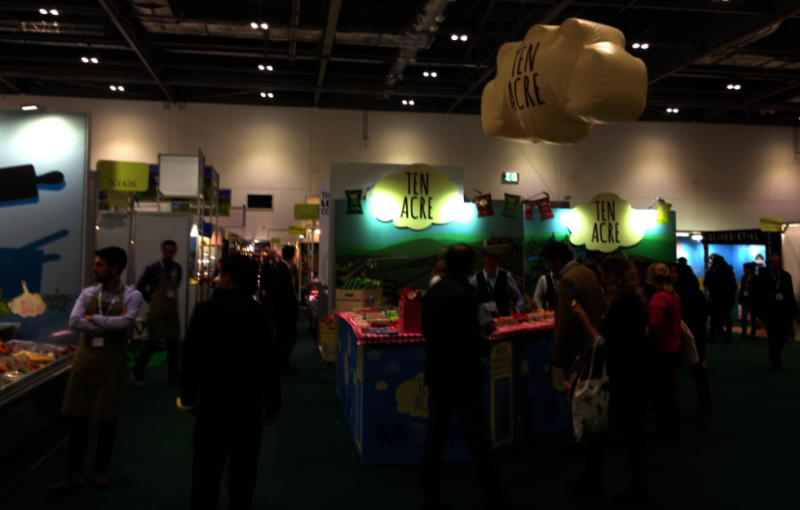 Are you planning to be part of a big trade show or just a small one? Bear in mind that booth spaces can be expensive, especially if you want to be in a high-traffic flow area. Research upcoming trade shows that are related to your industry: Make sure you choose the event that’s relevant to the products you’re offering. There are a number of trade shows held every year so do your research and choose the right one for you. To help, we've compiled a list of upcoming local and international trade shows in the food and beverage industry. Register for the show and reserve your spot: As soon as you find the right event for you, register for it immediately so you've got more options for stand locations. Remember, having a “strategically-located” booth will increase your exposure and will make it easier for your clients to find you. This is also the best time to book your hotel rooms and make travel arrangements so you can take advantage of the best deals. Start planning your stand design: There will be A LOT of other Exhibitors at the event so it's good to stand out! This is an excellent opportunity to engage face-to-face with a huge number of prospective customers and you'll want to make a good first impression! Set a theme for your stand design and decide on the experience that you want customers to have when they walk on to your stand. If you've got new equipment to show, set up a demonstation area or if you're launching a new product have some samples to try. Always remember to keep your space open and inviting. You don't want to scare prospective customers away! Include something novel or something of value not directly related to your product: Think about including something that encourages attendees to drop by. You could set up a phone charging station at your booth, a live Instagram printer in your area or offer a refreshing drink! The possibilities are endless so have a think about anything fun or novel that aligns with your brand and messaging. Get your marketing materials ready: Trade shows are all about introducing your brand and showcasing your products. You’ll want to have a sufficient supply of brochures, fliers, price sheets, and order forms on hand. Alternatively (and this is our top tip) you can opt for a digital catalogue to showcase all your products. By using the digital catalogue within the Ordermentum app new customers can see your entire product range and order your products straight away. That way you'll start generating sales immediately. Prepare your products: Whether you'll be giving away samples of your goods or doing a live demonstration of your equipment, you need to get your products ready in advance - so check that everything works or order all the ingredients you'll need. There is nothing more stressfull than leaving yourself too short on time to make the products you want to showcase or having a piece of equipment fail half way through a demonstration! Contact attendees: Trade Shows are a great opportunity to meet with your customers face-to-face so it's always a good idea to personally contact your database to set up meetings or book them in for a product demonstration. It's also a nice touch to invite them for a post-event celebration as well. Decide who from your team will be at your booth: It's important you send your employees who are the experts in your products or service. You'll want your customers to be impressed with their product knowledge and for your employees to confidently field any tough questions or handle any objections. Trade shows are definitely an excellent way to boost your brand awareness and sales over a very short period of time but they also take a lot of time, effort and resources. By following the above timeline you'll be giving yourself a good amount of time to prepare so that your first Exhibition is stressfree and you will get the best return on your investment. Want to read more tips and advice from us? Check out the “Business Advice” section on our blog.